The Junior League of Dayton is a 501(c)3 nonprofit organization of women committed to promoting voluntarism, developing the potential of women, and improving communities through the effective action and leadership of trained volunteers. Its purpose is exclusively educational and charitable. The Junior League of Dayton strives to be a diverse and dynamic organization of trained volunteers, at the forefront of its community in meeting critical needs. What’s the critical element in Junior Leagues’ success over 11 decades? The power of the trained volunteer. The women of The Junior League gain unique expertise: the ability to identify the most pressing problems facing a community and then craft collaborative, effective solutions. The Junior League of Dayton is open to all women who strive to be informed and inspired catalysts for lasting community change. For the past century, we have built a legacy as Dayton’s volunteer powerhouse – a legacy of supporting our community through strategic, sustainable efforts, from hands-on volunteer hours to start-up grants to statewide public policy advocacy. 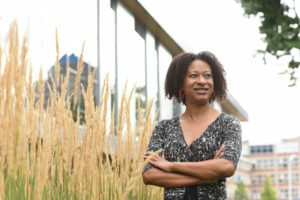 Civic engagement is about deepening our individual and collective connection to our communities and recognizing that we have a shared stake in its well-being and concerns. 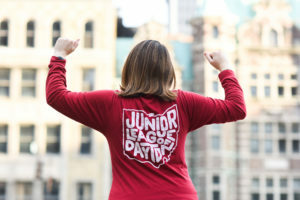 Junior League is not about volunteering for the sake of volunteering – it is about building and mobilizing support on an issue and serving as a resource in combating the problem. Our purpose is clear: to develop exceptionally qualified civic leaders who work beside community partners to identify the Miami Valley’s most urgent needs and address them with meaningful and relevant initiatives that improve lives and transform mindsets. Junior League believes in building networks of relationships across and within sectors of our community to move the needle on our most pressing issues. To do that, we employ a strategy called Issue-Based Community Impact (IBCI) that leverages the community and civic leadership skills of League members to meet those needs. IBCI focuses on changing, improving, and/or creating systems and services of importance to our community – of ensuring impact beyond the immediate or personal sphere of interest of our membership. For the past century, the Junior League of Dayton has mobilized expertise and resources to make the Miami Valley a healthier, safer, more vital place to live. Each decade, the League systematically evaluates the critical needs of our community and determines where we can most have an impact toward significant and sustainable solutions. More than 5,000 elementary school children living in our region need help learning how to read outside of school, and there are more than 50,000 adults 25 and over living in Montgomery County who need literacy assistance. 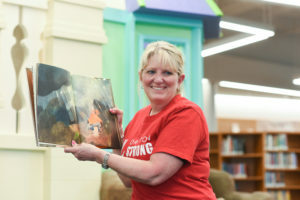 Through the establishment of strategic alliances, Junior League of Dayton strives to improve literacy outcomes for Miami Valley children and ensure that at-risk children and families have increased access to educational support programs and materials. Our current initiatives promote both reading literacy among elementary students and nutritional literacy among children and their families. Since summer 2016, we have impacted more than 8,000 children and caregivers in and around Montgomery County. Since 1920, the Junior League of Dayton has mobilized expertise and resources to make the Miami Valley a healthier, safer, more vital place to live.